Once again I was excited to discover a recent 2014 WINE SPECTATOR Top 100 selection among our shelves at Whole Foods Market North Miami. This Ernesto Catena (the eldest son of Nicolás Catena of Catena Zapata) wine had been selling briskly ever since I brought it in a few months ago but now that the word is out I am constantly refilling our shelves. Here’s hoping it continues to be available and does not sell out quickly as vinos tend to do once praised with this kind of attention. Luckily for us earlier vintages have also been rated in the 90+ range and deservedly so. Ernesto Catena Vineyards info: Tikal is owned by Ernesto Catena and is named after his son. Ernesto spent his childhood in the vineyards of Mendoza among wine-growers and local pundits. Since then, he has experienced a kaleidoscope of cultures, living in New York, Buenos Aires, Berkeley, Cambridge (MA), Milan and London. But his heart remains in his homeland of Argentina (where he now lives), with its natural beauty of mountains, streams and vineyards, its wines, and its people who hold a special passion for living. Luis Reginato is the winemaker at Tikal behind the 2012 vintage. He has been with TIKAL and the Catena family since 2002 overseeing various wine lines. In the 10 plus years he has developed a reputation of having a Midas-touch producing wines consistently rated in the 90+ range. Usually coming in under $25.00, I like the fact that these wines are not exaggeratedly priced. The Tikal Patriota can currently be found for $18-$23.00. I have long been a fan of the Malbec and Bonarda varietals and am excited to see such blends increasing in the marketplace. Some even including Syrah. 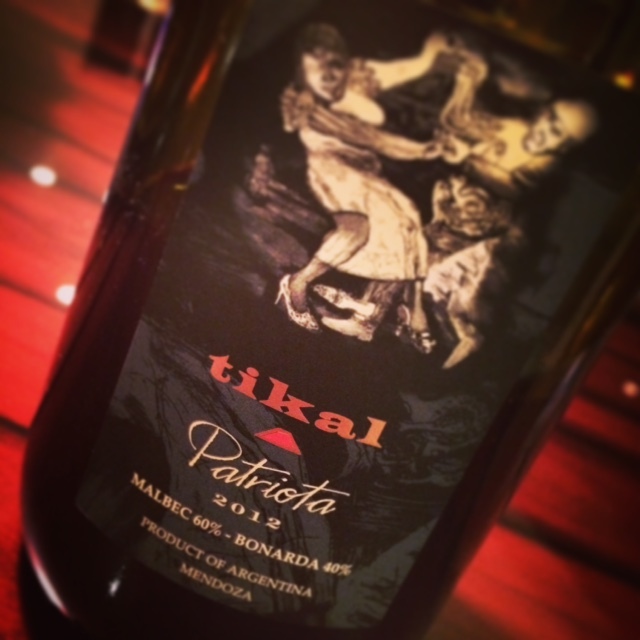 This one in particular comes in at 60% Malbec and 40% Bonarda from Vista Flores and La Vendimia Mendoza. Aged 12 months in 70% French and 30% American oak. My notes included red fruit [strawberry, raspberry] on the nose along with vanilla spiciness. On the palate the fruit flavors turned darker [plum, blackberry], chocolate, with the oak spiciness and earthiness at mid-palate and beyond. For me I think this wine needed to age a bit in the bottle or decant for longer. Although I started to imbibe as soon as the cork was popped, I did not note a varied difference at the 1 hour mark. Unfortunately I was not able to give the wine more time to develop which I feel it would have. Did I enjoy it? Wholeheartedly yes. Will I continue to recommend this wine and praise its accolades? Yes again. But, the next time I serve this wine you can bet it will be decanted for over an hour or if patience allows I’ll be drinking it 1-2 years from now when I believe it will be at its true peak. ¡SALUD! Deep reddish purple with aromas of bright berry/cherry fruit. Like swallowing a whole bowl of mixed ripe berries at once. Big body yet very balanced, with luscious layers of raspberry, cherry, and cocoa flavors. Just a hint of baking spice at the end brings it all together. Pairs well with grilled meats such as beef and pork, smoked ham, and even pizza with meat toppings. Incredibly fun to drink! A Malbec from Argentina! Great, I will have to search for this one. BTW do you still have that super star dog? I need to be drinking more Merlot!